Remember the ‘Talking Tom Cat’ app? “Talking Tom Cat’ featured a grey cat with a personality all his own. Fully interactive, ‘Talking Tom Cat’ was a delight to children everywhere with his silly voice and playful antics. Now, the makers of the popular app have released Tom’s female counterpart complete with a child mode safety net. Gifts- Just like Divas everywhere, Angela loves getting gifts. Tap the gifts button to present Angela with accessories, clothes or make-up. Fortunes- Tap the heart button and Angela will read you a fortune from her fortune cookie. Wardrobe- To access Angela’s extensive wardrobe, simply tap the coat hanger button and change her appearance. Facial Recognition- On iPhone 4s or newer, there is a face button that can be tapped to open the camera. Facial gestures can be used to communicate with Angela (nodding, smiling, sticking out tongue, yawning, etc). There is a “Child Mode” that can be selected when the app opens that halts in-app purchases (there are many, just like Talking Tom Cat) and gets rid of any questionable material (fortunes, drinks for Angela), making Angela appropriate for all ages. As previously mentioned, there are a few in-app purchases to navigate around, however the app if very functional without any additional purchases and makes a great addition to your child’s old favorite, Tom Cat. Talking Angela is also compatible with any physical ‘Talking Friends’ toys that your child may already have. Want similar apps? Here are 6 fun talking kid’s apps your children will love. Talking Angela can be downloaded for free via the button below. 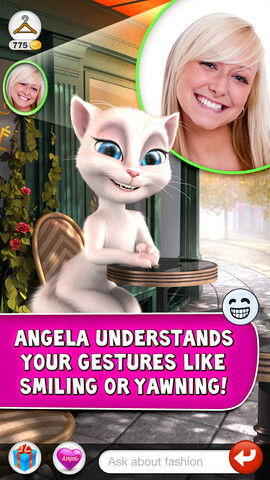 Talking Angela is supported on both iPhone/iTouch and iPad platforms.